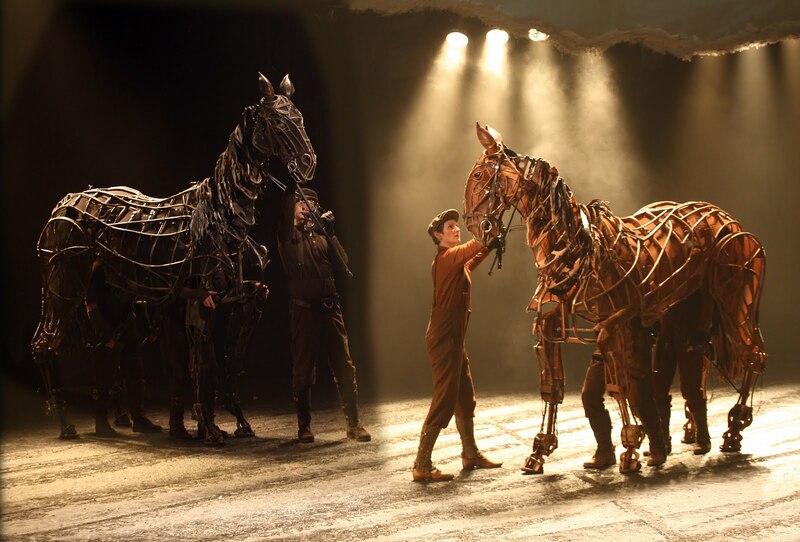 The acclaimed National Theatre Production of Warhorse arrives at the Lowry tonight for the first of a two part run which stretches well into next year. For those of you not familiar with the story which was recently made into a film by Steven Spielberg, it is adapted from the classic children’s book by Michael Morpurgo set in the First World War. The main character, a horse named Joey, is brought to life on stage via an incredible life sized wooden puppet operated by 3 puppeteers at once. We were lucky enough to see a preview of the show and “meet” Joey at the Manchester Tourism awards earlier this month and we can honestly say that you do not want to miss this show. Incredibly life-like, well acted and telling a beautiful heart-wrenching story, War Horse is theatrical innovation at its best. Why not enjoy the show with a glass (or two…) of wine and catch a Mantax cab home to ensure the evening runs smoothly? Pre-book using our iPhone & Android app and enter code PROMO5 to save £5 off your first journey. 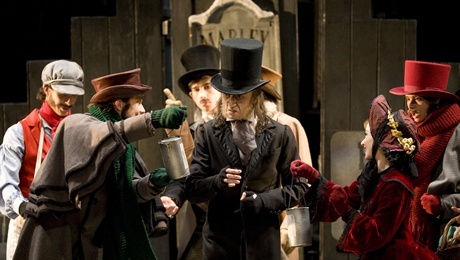 The colorful sets, vibrant score and elaborate costumes conjure up a wonderful re-imagining of a Victorian Christmas and the combination of classical orchestral music paired with well-known Christmas carols sung by the cast will surely delight the whole family. Carry on the Christmas magic after the show by booking a Mantax black cab and enjoying Manchester’s twinkling Christmas lights, our friendly drivers will be happy to show you the best spots in town! Book on 0161 230 3333. 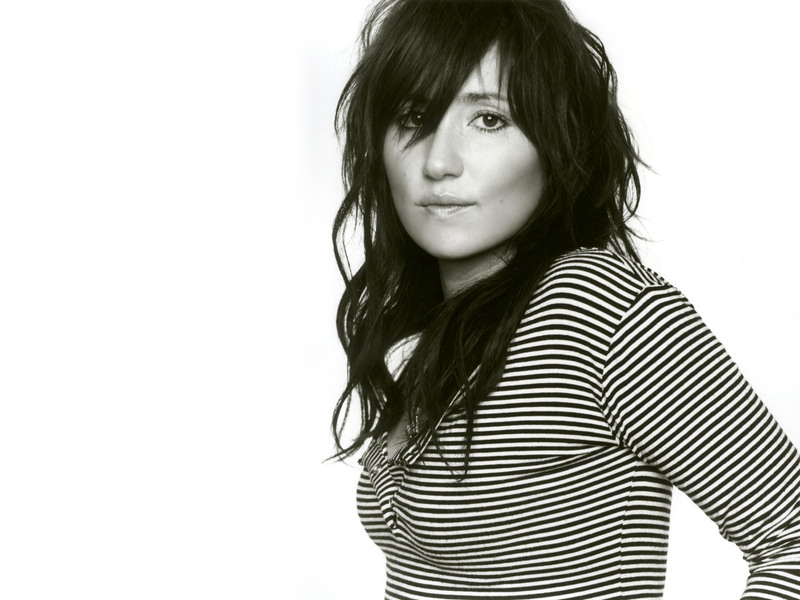 Having firmly established herself as an incredibly powerful singer-songwriter with sing-along classic “Suddenly I See” almost ten years ago (that makes us feel so old…) KT Tunstall is both a critically and commercially successful artist. Having released a whopping five albums since then, she won’t be short of material to draw on for tonight’s show at The Bridgewater Hall, and everyone knows a gig is the best way to start the week. Don’t forget though, it is a weeknight so don’t stay out too late! Get home safe & on time by pre-booking one of our roomy Mantax cabs through our iPhone or Android app. Use code PROMO5 to get £5 off your first journey and enjoy your evening. Today is the day we’ve been waiting for since…. oooh, January? Well maybe not quite that long but needless to say we’ve been incredibly excited about today’s launch of the 2013 Manchester Christmas Markets. With 9 specialised markets running the length of the city all the way from the Corn Exchange to Albert Square, expect sights, sounds and smells (mmm….mulled wine!) that will delight your senses and really put you in the festive spirit. Each market will have its own covered bar area so you can relax and enjoy a drink (our favourite is hot chocolate with Baileys) whatever the weather, but we would advise you wrap up warm and wear comfy shoes because nobody wants to get a heel stuck in those cobbles! 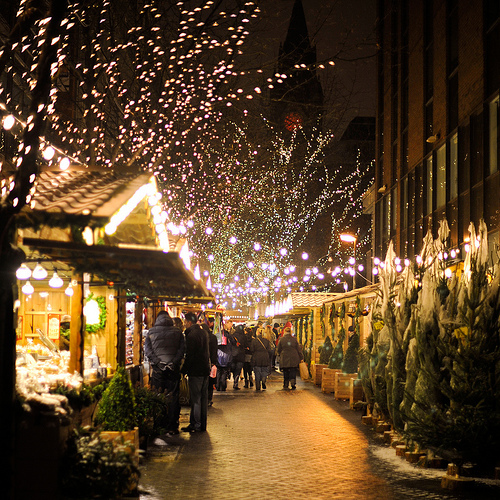 The markets open tonight and run until Sunday 22nd December, so there’s plenty of time so shop for gifts, taste delicious food and enjoy the magic of Manchester at Christmas. When you think of Spinningfields you probably think of fantastic architecture, great food and luxury goods stores. Well from now until 6th January you can add ice skating to that list! 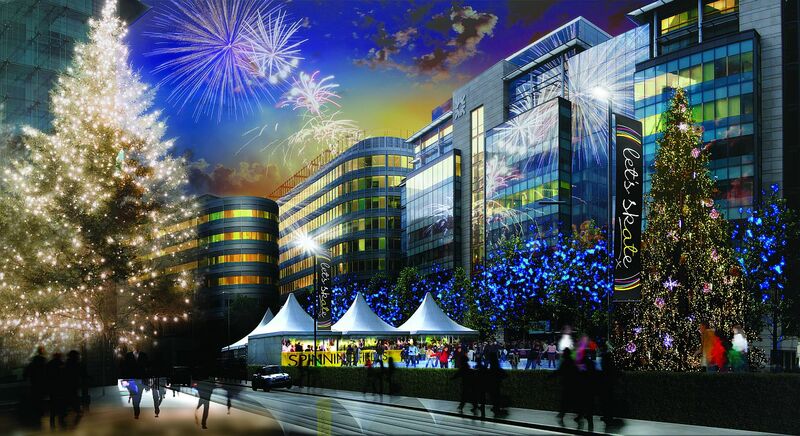 Back again and better than ever, this year the Spinningfields ice rink is joined by their very own mini Christmas market as well as a variety of pop-up bars and restaurants including Hibernate, from the people behind the fabulous InBloom which graced the city in summer. So why not head over there for a tasty schnitzel, a warming drink and an elegant glide around the ice (or a good time anyway, whether you fall on your bum or not…) and enjoy everything this part of the city has to offer. You can book your tickets online here to ensure that you don’t miss out on the fun, and there are discounts for children, students and family packages as well as the option to add a glass of bubbly to the experience. We think we’ll miss out on that one though, as we’d have a hard enough time staying upright on the ice as it is! All that skating might wear you out, but at least you won’t have to worry about walking home afterwards. Book a Mantax cab through our iPhone & Android app and enter code PROMO5 to save £5 off your first fare. Have fun! So after yesterday’s dose of culture with Swan Lake, tonight seems like as good a night as any to let loose a bit and get your bass face on. 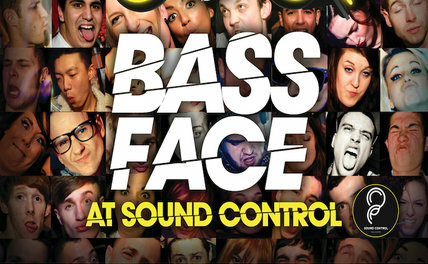 Bass Face is a weekly night held at Sound Control with three levels of shaky and bass-led beats. Expect to hear everything from grime and hip-hop to drum & bass and dubstep, and put on some comfortable shoes, no heels here! Having been to this awesome night ourselves we can tell you it might be a good idea to book tomorrow off work, as you won’t stop dancing until well into the early hours of the morning. Sound control is located right next to Oxford Road station but why not pre-book a 5 seater Mantax taxi on 1061 230 3333 so that you and your mates don’t have to worry about leaving early to catch a train. That way you won’t have to miss out on any of the fun, and can focus on making the weirdest faces possible all night. Have fun! Opening tonight for a five day run at the Lowry Theatre in Salford Quays is Matthew Bourne’s three-time Tony Award winning production of Swan Lake. This original, provocative and innovative re-imagining of the traditional ballet is widely regarded as a modern classic and simply shouldn’t be missed. Having already been enjoyed by audiences across the world from America to Australia, the production includes an all-male cast and fuses dance, comedy and spectacle for an unforgettable show. If your only reference point for ballet is girls prancing around in tutus then prepare to have your mind blown as you watch the traditional story reinvented into a modern Swan Lake for the 21st century. Make sure you arrive before the curtain call by booking a beautiful Mantax cab direct to your door. You can book using our iPhone & Android app or by phone on 0161 230 3333 and can expect a reliable and friendly service.